This guide is designed to assist you when processing periods of sickness for your employees. When one of your employees has time off sick, you may need to pay them Statutory Sick Pay (SSP). Payroll Manager is able to determine whether or not your employee is entitled to SSP and if so automatically calculate how much is due. 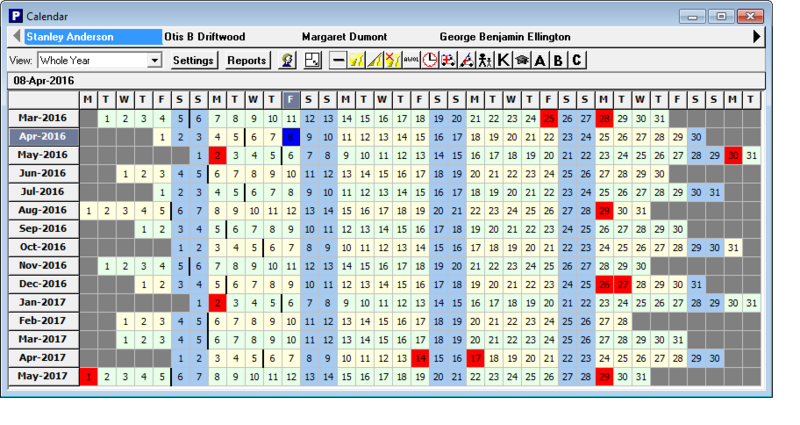 1) – From the main menu, click on ‘Employees – Calendar’, then select the appropriate employee. 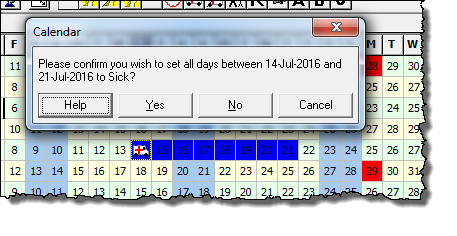 2) – Click the first day on the calendar that the employee was sick and then click on the ‘Ambulance/Sickness’ symbol from the calendar toolbar. 3) – Click back on the first day of sickness (which will now show an ambulance symbol), hold down the left mouse button and drag along the calendar, selecting the amount of days off sick. A dialogue box will appear asking you to confirm the amount of days selected are correct. When highlighting the sick days, you must select all days that the employee was sick, regardless of whether these are working days or not, in order for the software to correctly calculate SSP. The employee must be sick for four consecutive days or more in order to qualify for SSP. (4 or more consecutive days off sick forms a ‘Period of Incapacity for Work’ or ‘PIW‘) – The first three working days of this sick leave are classed as Waiting Days and no SSP is payable at this point. On the next working day following the 3rd waiting day the ambulance symbol changes to SSP, indicating that statutory sick pay is now payable. 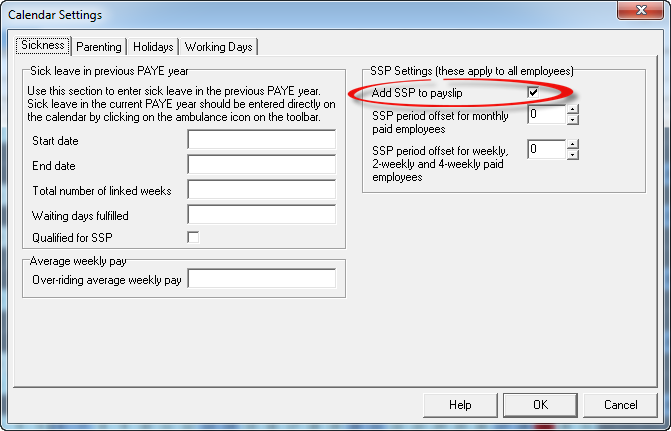 4) – To add SSP to an employee’s payslip, click on the ‘Settings’ button, select the Sickness tab and click in the box ‘Add SSP to Payslip’. 5) – The SSP payable will then appear in the Pay Details screen in the ‘SSP, SMP, SPP & SAP’ column in the relevant pay period. For tax year 2019-20 the weekly rate for SSP is £94.25, which for an employee who works a five day week equates to £18.85 per day. What about ‘linked’ periods of sickness? – If an employee has a further PIW (i.e. a period of sickness of 4 consecutive days or more) and there is a gap of less than 56 days between the start of this new PIW and the end of the previous PIW, then any ‘waiting days’ served in the original PIW count towards the three waiting days required in the second PIW. Payroll Manager ‘links’ PIWs automatically.